Each year WAI hosts an educational conference in a different country to unite industry experts from around the world who share the latest research findings in a particular segment of the wire and cable industry with their peers and colleagues. 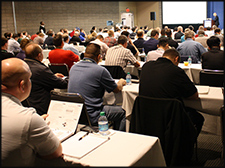 Usually scheduled over a two- to three-day period, the International Technical Conferences (ITC) include white paper presentations—which are typically offered with simultaneous translation—a tabletop exhibition, plant tours, guest tours, and social functions. The 2016 International Technical Conference was held in Monterrey, Mexico. Past ITC locations include: Germany, Turkey, India, the Czech Republic, Mexico, Italy, Canada, England, Poland, and Belgium. Tabletop exhibits are typically offered in conjunction with the conference. Exhibiting companies comprise of suppliers to the industry and manufacturers of wire; cable; and fastener, formed and fabricated wire products. Historically, exhibiting companies have represented all sectors of metal and fiber. International Technical Conference delegates receive Conference Proceedings materials which include all of the papers that are presented at the event. Experts give technical and operational presentations throughout the conference on topics concerning the ferrous, nonferrous, electrical and general segments of the industry. See the Call for Papers if you are interested in presenting at an upcoming conference. The Wire Association International, Inc., founded in 1930, is a worldwide technical society for wire and cable industry professionals dedicated to the promotion, collection, and dissemination of technical, manufacturing, and general business information and trends in the industry. Throughout the year WAI organizes events such as Interwire and the WAI Operations Summit & Wire Expo trade shows, an online Industry Search, and annual International Technical Conference. Its publications and technical products include Wire Journal International (WJI), the annual WJI Reference Guide, HardWIRED educational newsletter and videos, as well as a host of technical handbooks, webinars, and DVDs.